An event dedicated to Azerbaijan’s traditions of multiculturalism and multi-faith harmony and tolerance has been held at the Sinai Temple, which is one of the largest and most influential synagogues not only in Los Angeles, but also in the entire U.S. as part of the California visit of a delegation of Azerbaijan’s faith and community leaders led by Chairman of the State Committee for Work with Religious Organizations Mubariz Gurbanli. Jointly organized by the Sinai Temple, the Consulate General of Azerbaijan in Los Angeles and the American Jewish Committee’s Los Angeles Office, the event brought together by around 300 visitors, including Consuls General of foreign countries, elected officials, representatives of different ethnic and religious communities, faith leaders, and journalists. The event was opened with an impressive performance of national anthems of Azerbaijan, U.S. and Israel by Sinai Temple’s cantor Lisa Peicott. Following the performance, Rabbi Erez Sherman of the Sinai Temple emphasized the importance of this multi-faith event. He mentioned the 2015 trip of 45 members of the Temple to Azerbaijan, noting that the journey offered the opportunity to learn more about Azerbaijan’s model of interreligious tolerance and harmony up-close. Addressing the event, President of the American Jewish Committee-Los Angeles Scott Edelman highlighted the strong and exemplary relationship and cooperation AJC has established with Azerbaijan since many years. Recalling his travel to Azerbaijan as part of the annual AJC delegation, Edelman praised what he and other members of the delegation experienced during the visit, especially in terms of mutual respect among religious communities that continue to live together in peace and harmony. 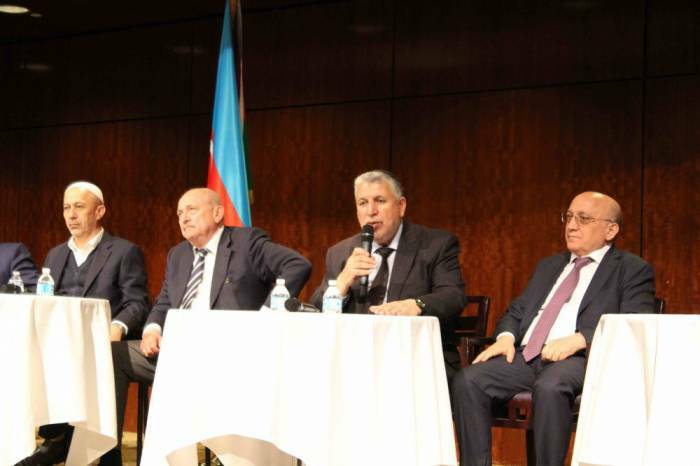 AJC-LA President expressed their satisfaction of co-hosting this important event highlighting in the case of Azerbaijan the possibility of interreligious acceptance, respect and mutual embrace. In his remarks, Chairman of the State Committee for Work with Religious Organizations Mubariz Gurbanli noted that the Azerbaijani tolerance has very solid foundations, rich traditions and deep historical and cultural roots. He pointed to the strong relationship between the ethnic and religious communities, saying there is no ethnic, religious and racial discrimination in the country. Stating that 809, including 31 non-Islamic religious communities have been registered in Azerbaijan, Gurbanli said that people belonging to all religions live in a mutual understanding and peace in the country. Addressing the event, Consul General of Azerbaijan in Los Angeles Nasimi Aghayev expressed his gratitude to the Sinai Temple and the AJC-LA for partnering with the Consulate General in arranging this wonderful event showcasing Azerbaijan’s long-standing traditions of tolerance, inclusion and multiculturalism and the centuries-long peaceful co-existence of all peoples and religions in Azerbaijan. Speaking to the event, Deputy Chairman of the Caucasian Muslims' Office, Deputy to Sheikh-ul-Islam of the Caucasus Fuad Nurullayev, Milikh Yevdayev, President of the Religious Community of the Mountain Jews of Baku Milikh Yevdayev, President of the Religious Community of European Jews of Baku Aleksandr Sharovskiy, President of the Albanian-Udi Christian Religious Community of Azerbaijan Robert Mobili, and the Archpriest of the Baku Eparchy of the Russian Orthodox Church Elnur Afandiyev highlighted the ancient traditions of tolerance and multiculturalism in Azerbaijan noting that these traditions have already been elevated to the level of state policy in the country. In their remarks, they stated that people of different ethnic and religious backgrounds, including Muslims, Christians, Jews and representatives of other faiths have been living together in peace, brotherhood and mutual respect for many centuries in Azerbaijan. The event featured the screening of a short film on Azerbaijan's multiculturalism. Following the screening, American pianist Jason Abrams performed Azerbaijani music, which was received with applauses by the audience. A photo exhibition reflecting the traditions of multiculturalism in Azerbaijan was also presented to the event participants.